I'm increasingly amazed at IPython Notebook, and want to use it for an interactive tutorial. I'd like the notebook to be full of exercises for the student to fill out, and to get feedback from the notebook itself - a lot like CodingBat but in IPython Notebook format. Next step - maybe - would be to finish with a scorecard cell summarizing the student's overall progress. Like every open-source author, I'm eager for feedback! I would love to see SQLPython and IPython notebook together! If you do decide to work on it, please post it on GitHub and mention it here. Probably the simplest way is in http://ipython.org/ipython-doc/stable/interactive/reference.html under "defining your own magics". It's pretty trivial to set up a %connect line magic and a %sql cell magic. See https://gist.github.com/3872878 for a hacked up quick example. Very nice! This could be great for my students. where p is callable object (for example function) with sql statment as argument. Can the "Success!" output be turned off? Can the test be an automatic so the @test decorator isn't needed? Either way, this is cool! 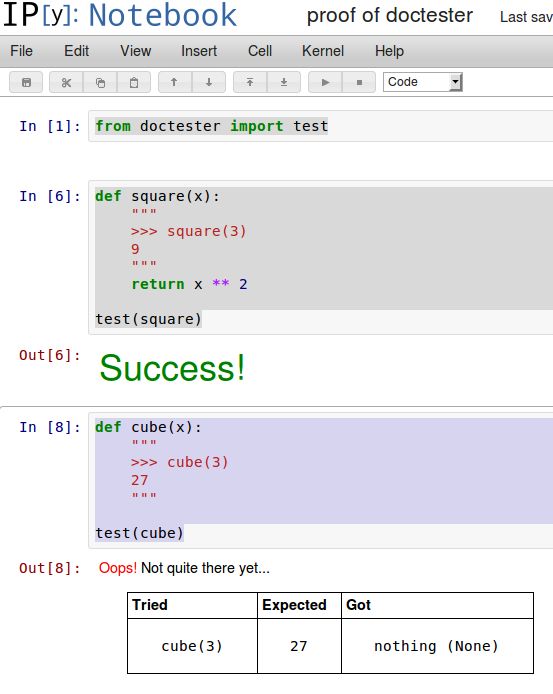 I tend to prototype in IPython then move code to an ide when it works as desired. This could help me create tests while prototyping instead of delaying it to a later date.